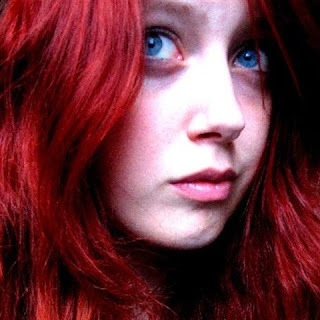 A few days ago I told you about a new website I've discovered called One Night Stanzas which is the brainchild of a flame-haired, young lady called Claire Askew. As I said before, but it's worth mentioning again, this is a site devoted to encouraging young poets and is a cause I'm happy to champion. Anyway, I promised you an interview with this young lady and here it is. Claire Askew was born in Northallerton, North Yorkshire in 1986. As soon as she learned how to read, literature became a big part of her life. She received the first credit for her own writing at the age of seven, when a short story she had written for a local fete won her a silver spoon of all things. At nine years old, Claire’s family moved to Kelso, Scotland, and throughout her adolescent years, she continued to collect writing credits. Claire's recently given an interview at iCiNG where you can find out about all her adventures since then, her time at university in Edinburgh, her numerous writing awards, Read This, the magazine she runs in addition to One Night Stanzas, the poetry group she felt she had to found or the kids she teaches. Beyond these basics, I thought I'd ask her a few in depth questions befitting such an interesting person. 1. Claire, from what I have read about you online it is clear you are passionate about poetry and yet your focus seems to be on educating those who are following in your wake. Why not concentrate on your own craft and let them find their own way? It’s a combination of factors, really. First and foremost, I still see myself as a youngster (I’ll turn 23 in March), and although I am now beginning to get to know the ropes, not all that long ago I was still starting out – totally clueless, intimidated and with very little confidence in my own work. I remember how scary it is to be just starting out and not knowing whether or not you’re any good... the vast majority of the emails I get from people are just asking “do I actually have any talent at all? Is there any point in carrying on?” I clearly remember thinking like that, and so I reckon I can provide advice that older, more established poets can’t, because they’ve got too removed. Something else that’s inspired me to try and offer help and advice to other poets is the sheer lack of both those things in the poetry world. I don’t think I’ll ever stop being shocked by some of the snobbery and nastiness you encounter from poets, critics and editors throughout the poetry world. Writers are disturbingly competitive – poets most of all, perhaps – and when you’re just starting out, this can be really, really off-putting. Young writers in particular are shunned and even ridiculed, and it’s really hard for them to find anyone who’ll just give them the information and guidance they need to improve their work and build up a profile for themselves. I experienced this myself up until relatively recently, and I’ve also heard about other people’s (sometimes terrible) experiences via the many letters and emails I’ve received during my time at Read This. That was another reason for setting up One Night Stanzas: since I set up Read This a year ago, I’ve had so many young poets contacting me, asking for advice on everything from just writing a good cover letter to knowing whether they should chuck in the towel or not. I realised pretty quickly that there was a need for a resource like One Night Stanzas, and so with my limited technical abilities, I eventually created one! 2. You've said that your father introduced you to poetry and remains your most honest and useful critic. I'm rather jealous because neither of my parents had any interest in literature. Where do you stand on the whole nature vs. nurture divide? Neither of my parents are artistic people (though they’re both creative in their own way), but I do think that they’ve influenced my urge to write and do what I do. My father works in PR and writes brilliant journalistic copy, and my mother works in early-years childcare regulation and is passionate about helping and educating young people. Both of them are incredibly supportive of my creative endeavours, and they both give me feedback on my work when I need it... my Dad’s just rather more honest (and by that I mean more comfortable with nitpicking and pulling me up on mistakes!) than my Mum. Both encouraged me to read constantly as a small child, too, which I think really moulded my personality – like most writers, I am a complete bookworm to this day. Otherwise, I think there must just be creative genes in the family somewhere! My sister is an illustrator and my cousin, who’s around the same age, is training to be an art teacher; my Mum’s doing our family tree right now and she’s found an amateur poet a couple of generations back. A lot of the family are quite musical too, so I reckon I’ve just inherited the rogue gene! 3. In an interview the poet Philip Larkin was asked what he had learned from his study of Auden, Thomas, Yeats and Hardy, to which he responded, albeit by letter (since it was a postal interview): "Oh, for Christ’s sake, one doesn’t study poets! You read them, and think, That’s marvellous, how is it done, could I do it? And that’s how you learn." How do you feel about that? I think that’s absolutely true. I’m actually strongly against the way poetry is currently taught in schools, and to an extent, in universities, too (I currently work as a tutor of English at secondary school level and to be honest, I’m pretty strongly against the way everything’s taught in schools, but that’s another story). Most people’s first experience of poetry comes from school, and more often than not, they get a great classic poem plonked in front of them, and are told to “analyse” it. Students come away thinking that a poem is something ancient, irrelevant and difficult; something they need to chip away at before they can take away anything meaningful from it. As a result, some people spend their whole lives not knowing that a poem can just be enjoyed, and I think that goes a long way to explaining poetry’s dwindling audience. The “study” of poetry can also be harmful to aspiring young poets. As Larkin says, you learn by reading and paying attention, not by criticising and analysing individual pieces until they lose all sense of unity. I’ve heard young poets say things like “I’m no good because don’t put enough hidden meanings in my poems!” – because they’ve been taught to approach poems as riddles to be solved in the classroom, they don’t actually know what writing them entails. So Larkin is absolutely right: poetry should not be studied, it should be absorbed. That’s a much more meaningful and powerful approach. 4. Throughout my life I have found a great reluctance amongst poets to explain their work. How is a young poet ever to learn if a poet keeps all his cards to his chest? I’ve found the very same thing, and that’s another of the reasons for One Night Stanzas. As a young poet I was desperate for guidance, and because I was unable to find any, I made some silly mistakes and wasted valuable time. I found plenty of “get paid for your writing!”-style websites (I think there are even more of these now) which of course did way more harm than good, but try as I might, I couldn’t find much information or advice from real poets. What young writers really need is guidance from those of us who are already in the fray, so to speak, and I don’t understand the general reluctance about providing that... you don’t necessarily have to explain or compromise your own work in order to do so. I think perhaps we’re all too concerned about our own reputations – I think we’re worried that young poets are loose cannons who don’t know ‘the etiquette’, who might one day show us up in some way. I also think that some established poets feel threatened by young talent – I’ve certainly encountered individuals who seem to actively discourage young, uncertain writers. However, it makes no difference really – young writers will always push on through, because they haven’t yet become jaded or tired; they’re still excited by hard facts of the words themselves, and they still see publication as an achievement to be proud of. It’s that attitude that I admire and want to encourage through One Night Stanzas. I absolutely love Philip Larkin’s work, so I’m very flattered indeed, and quite surprised! Now that you point it out, I do see the similarity, but I’ve never thought of Larkin as one of my major influences. I’ve read a great deal of his work, though, so he’s obviously made his mark. But I “see” other poets’ influence on my work much more clearly – I feel, for example, that Liz Lochhead and Edwin Morgan are floating around on the sideline of many of my poems, no doubt waiting to tell me off for pilfering their ideas! 6. You say elsewhere, and it's the advice that any writer worth his salt would give, that an upcoming poets should, if I can quote you: "Read. Read, read, read, read and then read some more. Reading other people’s poetry is the only way to make your own poetry better, and that’s something you should always be trying to do." There is however a lot of bad poetry online. Would the novice not do better to stick with established poets and aim high? It may be cheap and convenient, but avoid reading amateur poetry and try to read people who are published in some form or another. This may sound like snobbery, but it isn’t: if you want to get published, reading published poetry is the best way to understand what ‘makes it’, and the best way to turn your own poetry into something publishable. 7. You are not only a poet, you have worked in the theatre directing your own play no less and you have won a prize for your short fiction. In Poet's Letter Magazine you say "Obviously, I didn't just write poems…" Why 'obviously'? I was referring to my very earliest ‘serious’ writing, which began in my last couple of years of high school. I think very few young writers begin by writing only poetry – perhaps mainly because you quickly become aware that poetry is not going to gain you any respect from your peers! Almost all the writers I know who are under the age of 20 write in other genres too, whether that means creating fiction or writing copy for the local paper; I recently spoke with a 19 year old poet who also has four separate novels on the go! Nowadays – with the exception of writing for One Night Stanzas – I focus solely on my poetry. I’ve dabbled, and I’ve discovered what it is I really want to write. I think that’s what you do when you’re young... I think that’s where the ‘obviously’ came from! 8. In the past there was a clear distinction between prose and poetry, one rhymed and the other didn't (okay that's a gross simplification), but do you think that we should stop making a distinction between the two and just accept the fact we're all 'writers'? I'm thinking particularly with the rise of flash fiction which is in many ways less demanding than poetry and yet satisfies some of the same needs and also the prevalent it's-a-poem-because-I-say-it-is school of thought. I think many poets out there would love to be able to hide their true identities behind the benign, all-encompassing term that is ‘writer’, but I’m not one of them. It annoys me endlessly when (usually in workshops) people say, “that line reads too much like prose,” (because unless every poem you write reads like a page from The Lord of the Rings, does it really matter? ), but at the same time, I think there is an argument for keeping the two genres separate. I think the mindset and creative processes of a poet are very different from those of a prose writer (which is why I always greatly admire anyone who can write both well), and the effort and skill required to build a good poem (or a good story) should be celebrated in its own right. Each is complex in its own way, so to chuck everything together feels a bit unjust. I’ve always been rather confused, however, about what exactly constitutes ‘prose poetry’, or about why people seem to want to lump flash fiction and poetry together. I’ve also been accused of writing poetry that is ‘just prose with line breaks’ before now, so perhaps I am not the best person to comment on the distinction between the two! I'm going to break the interview here. In the second part Claire talks more about her sources of inspiration, the difficulties she has encountered trying to establish herself as a poet in Edinburgh and how you can help with her latest project. business almost as usual, though I daren't leave. drink tea from flasks, sandblast, dig up pipes outside. about on the slats, four floors up – a precarious ballet. wake me early, and pack it away, whistling. Great interview, Jim! Ahh the energy of youth or is it her gorgeous red hair that keeps her fired up for the cause?! I think it's fantastic what Claire Askew is doing. I wasted ten years writing mostly mince because I simply didn't know how else to go about it. It's so refreshing when the interviewer has almost as much wit as the interviewee ('bit of a joke there). I wish I could've been able to even 'find my arse with both hands' when I was 23, it's great to have a head-start on a brilliant career, good luck to you Claire. Sorlil, yes, I really hope it isn't a flash in the pan. It really all depends on the level of support she gets. We all have different experiences of becoming poets and we all write different poetry. I wouldn't know where to start writing about sunken ships but you obviously find it natural. The question is, how did we discover our particular voices? I always remember The Glenn Miller Story, the one with Jimmy Stewart. In particular it's the scene where the trumpeter cuts his lip and Miller get the sax player to fill in and there it is, the sound he'd had in his head all those years. One of the things I try and remember is what I felt like when I was in my teens. I really had a chip on my shoulder. Part of it was no doubt a reaction to how people treated me when they heard I was a poet. I really thought I was good and I really wasn't. So I can understand how a lot of young poets will be ultra-protective of their craft but I really hope that the site covers the nuts and bolts aspects of writing. Poetry is as much of a craft as writing music and a little technique can go a long way. And, Ken, I agree. By her age I'd certainly published enough – I'd reckon about 50 or 60 poems – but her involvement in poetry is so different to me. Writing is the focal point of her life, not something that gets fitted in, certainly not a hobby. She's just been asked – asked I tell you – by a publisher to submit a collection of poetry which they will publish. That is impressive. More power to her elbow I say. Great to find a poetess around a similar age as myself. I'm impressed she has done so well. Indeed, it reaffirms my own mediocrity. But, it is good to see someone so charged and 'knowledgeable' in their craft. Personally, I feel I have no idea, just a 'minor' amateur poet, who has no idea how to venture into the 'real world of poetry'. This was a great interview, good insight, I would love to get in touch with her actually. Submit some of my dross. I think the division of prose/poetry breaks out over sound especially. Poetry must sound good. It must call to be read aloud and shared. Prose, on the other hand, simply communicates (if I may be so gross) while poetry sings. I wonder how Claire would feel about this distinction. Also, I don't know how much you folks across the pond have to deal with LANGUAGE "poetry" and other avant-garde sillyness but I would wager a lot of it needs a third term -- it's something not poetry or prose but dependent upon not only words but visuals -- like cummings grasshopper poem and comic books -- I think we'd be better suited to divide literature into thirds. Hm, my initial reponse seems to have gone, no doubt a spaced out moment on my part. Great interview, really encouraging in many ways to hear of a successful young poetess. Makes me cringe at my own poetry. Her poetry is succint and clear. My poetry is 'a few poles short of some scaffolding' much like my mind. But hey! There a many ways to articulate your mental. I would love to get in touch with her actually. Submit a poem or simply ask a few questions. Glad you posted this. Linking all us poets together. McGuire, first things first, you didn't lose your first comment. I have comments moderation on so that I can screen what comes through. I dislike anonymous comments in particular. It certainly looks as if her site is right down your street and she is very approachable. As far as sending her some of your own work perhaps you might want to point that to her magazine Read This rather than One Night Stanzas. Questions should go to One Night Stanzas. This is definitely a place to get involved with. And, G.M., I'm not one who holds that all poetry should be read aloud. I conceive my work to be read on the page/screen to oneself. That doesn't mean that a lot of my poems couldn't be read aloud but most are so short that I'm not sure how they would go down at a reading. As for all the "avant-garde silliness" as you call it, no we're not exempt over here but I'm probably the wrong person to ask since I tend to work here in my own wee bubble. What I've read of it frustrates the hell out of me because I don't like not getting stuff. I recently bought a couple of huge volumes covering the poetry of the entire 20th century but focusing on America and there really was so much tripe in there. Cummings in particular. If anyone knows a decent book that explains why the hell he does what he does then please let me know. I don't like not knowing. I feel there's something there that everyone else gets and I'm the only one not in on it. As for what Claire thinks…I expect she'll let you know. Hi guys, glad you all seemed to enjoy part one! This book focuses on the more avant-grade and pictorial side of Cummings, putting it in context with the fact that much of Cummings was sentimental love poetry, or just plain silly. Cummings was a painter first. He was in fact better known in his day for his paintings than his poems. But the point is that his visual sense strongly affected his poetry, its visual aspects, and its arrangement on the page. This book BTW also contains the meatiest of Cummings own essays about poetry and art. Really, this is the most illuminating book on Cummings I've run across in years. Thanks for that, Art, I've ordered a copy. Yes, I'm impressed as well, Jim, both by interviewer and interviewee. It also made me even more determined to never look at the poetry I wrote when in my twenties...I'm looking forward to part two. Thank you, Conda, I was going to put it up the next day but it's a lot and I think what she has to be said is worth taking time over.